So, about 6 months ago, I pulled out an old binder I'd been saving for such a project and made a very simple cover for it. 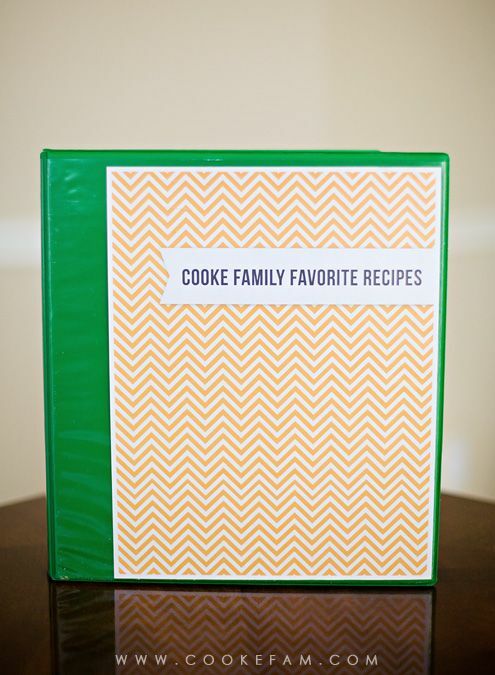 My rule about this book (so it doesn't become cluttered) is that only our most favorite recipes are allowed inside. Only things I have personally made and only things that my family (and I) love. Very few recipes make the cut! On the left side of the binder, in the front pocket, I put recipes that I've printed off to try for the week (I plan out weekly menus). 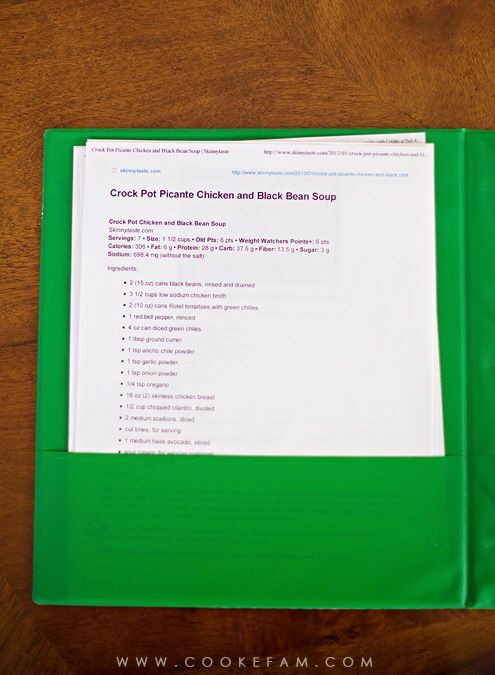 Sometimes I may not have anything in this part of the binder if I'm making all previous recipes that week. But I try to do something new at least once a week. And I always keep the recipe print-out to one page (you'll see exactly why later). Usually I try to include a photo, but it looks like one didn't make it on this particular print-out. 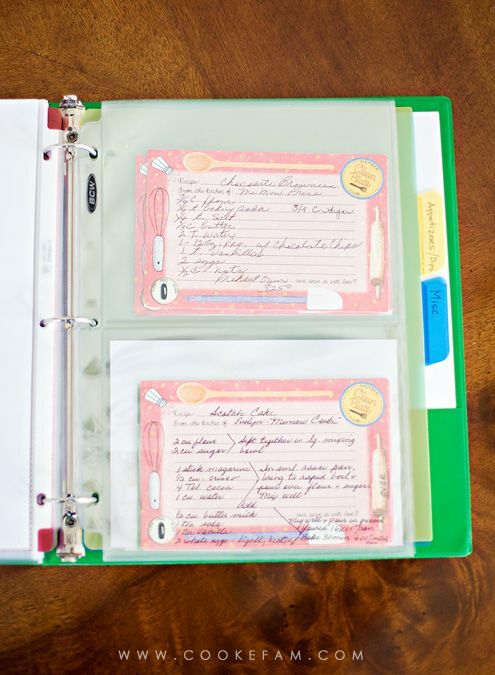 The actual binder rings hold recipes that are "keepers" and are stored in page protectors. That's why I keep it to one page. 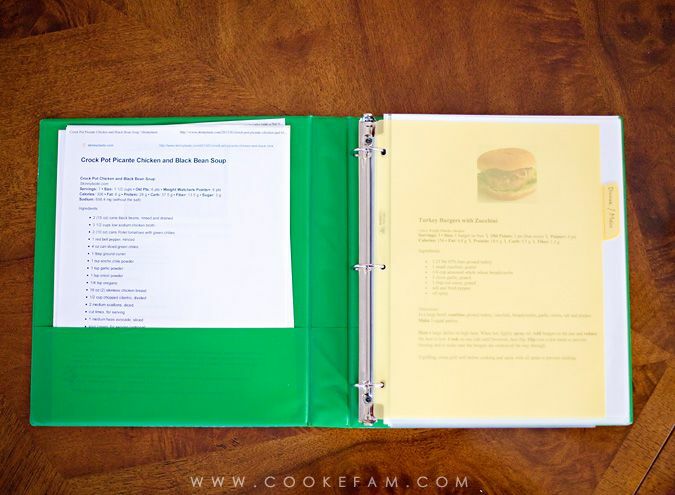 I put two recipes back to back so that there are two for each page protector. After I've made a recipe and decide that it is worthy of the binder, I put it where it belongs in the binder. There are 7 categories separated by dividers: Main Dishes, Crockpot Meals, Sides, Breakfast & Bread, Dessert, Appetizers and Dips, and Dessert. 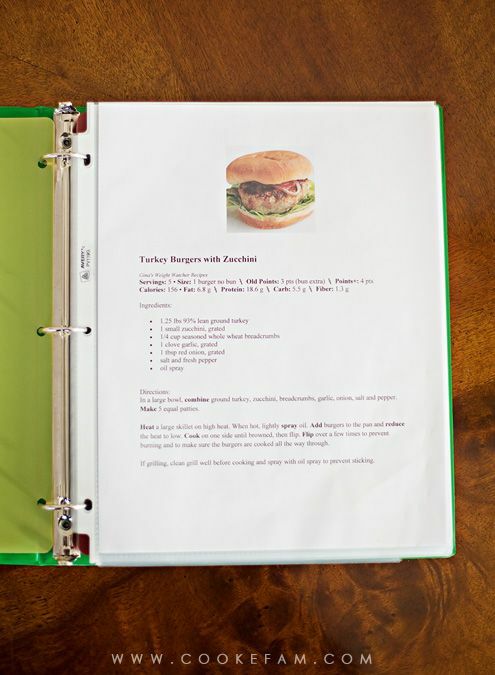 The reason why I like this binder so much is that it stores other favorite recipes too. 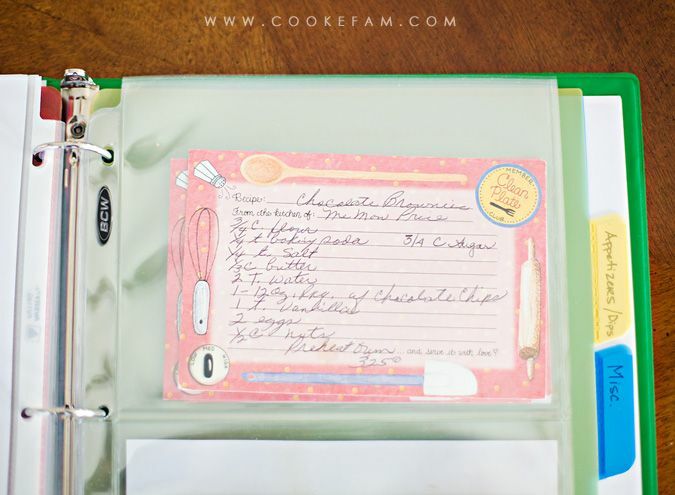 I used to have a basket that was designed to hold recipe cards like the ones below. I hated how long it took me to look through them and pull one out and I hated that my recipe cards were always getting dirty when I cooked. So, a quick search on Amazon brought up these page protectors that can hold two recipe cards up to a 5x7 size. Perfect. And they keep my cards clean. I could just type up these recipes, but honestly, most of them were given to me at a recipe shower a friend held for me right before Casey and I got married (a really neat idea, by the way...I still use many of the recipes and they are favorites). Some of them (like the one below) are in the handwriting of very special people. That one for Chocolate Brownies is from Casey's Memaw Price. Apparently she never really made these brownies when he was a child, but they are his absolute favorite now. And since she is no longer here on earth with us, I treasure this recipe in her handwriting. I want to keep it just like this instead of typing it up. I've been using this binder successfully for about 6 months now, so it's proven to be a system that works for me. And the best part is that now that's it's populated with our favorite recipes from the past 6 months, I have an easy way to pick out some stand-by meals when I'm planning our weekly menus. I flip through this and then pick one or two new recipes from Pinterest. Easy. I have the same system and love it. it really works well and I have the same issue, I like having a hard copy in front of me. I have been toying around with getting an ipad stand for just this reason. Also considered making a blurb book. Maybe I need to just keep it simple and do a binder!